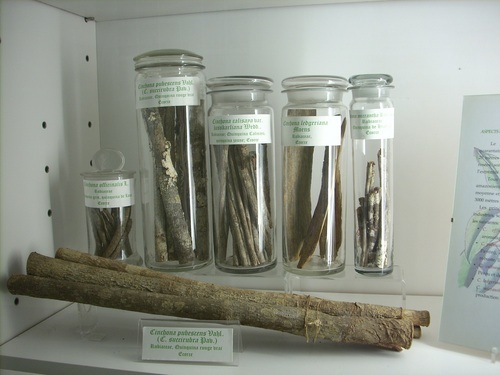 These samples of various kinds of Cinchona wood can be seen in a show case of the Musée des Plantes Médicinales et de la Pharmacie, inside the Institute of Pharmacy of the Université Libre de Bruxelles in Brussels (Bd du Triomphe, B-1050). The active ingredient of Cinchona, the quinine, was isolated and named for the first time in 1820 by French researchers Pierre Joseph Pelletier and Joseph Bienaimé Caventou; it remained for a long time the only effective antimalarial drug1. 1. See M.Vanhaelen - R.Vanhaelen-Fastré, Plantes d'autrefois, médicaments d'aujourd'hui, Musée des Plantes Médicinales et de la Pharmacie, Bruxelles 2005, pp. 217 ss.